The snow is quickly melting and dripping off our roof today and the warmth of the sun is noticeably warmer. Can you guys smell Spring in the air yet? I'm so excited for this season. I'll be going skiing for the last time this season tomorrow and then I'm afraid the condition of the snow just won't be worth it but I am excited about my last run. I'm dreaming up some delicious recipes for Spring and it has me remembering some of my favorites from last year like this pizza! Combine all the ingredients for the pesto in a blender or food processor and pulse until nearly smooth. It should be thick and just slightly textured. Preheat oven to 400 degrees F (200 C) and line 2 baking pans with foil or parchment. Lay the pitas on pan and divide the pesto among them then spread in an even layer. 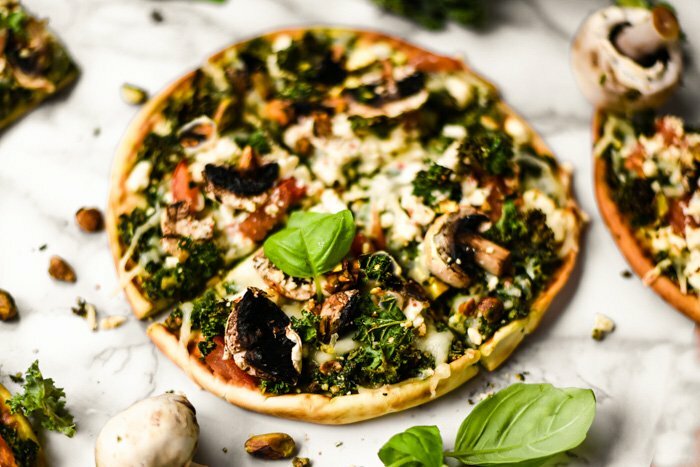 Sprinkle on the cheese and top each pizza with mushrooms, tomatoes, chopped pistachios, and a sprinkle of freshly chopped basil if desired. Bake for 15 - 20 minutes until the cheese is starting to brown along the edges. Remove pizzas and cool for about 5 minutes before slicing and serving hot. This recipe can be made on a full-size pizza crust rather than pitas.